I had chickens years ago, but hadn't had any recently until June 2011. As is usual for many people with chickens I got the chickens before I had a real place to keep them, so they had to hang out in the dog run until we could convert an old storage shed into a coop. Since my hubby isn't a carpenter & this summer the heat was unbearable it took much longer for this project than planned, months longer. 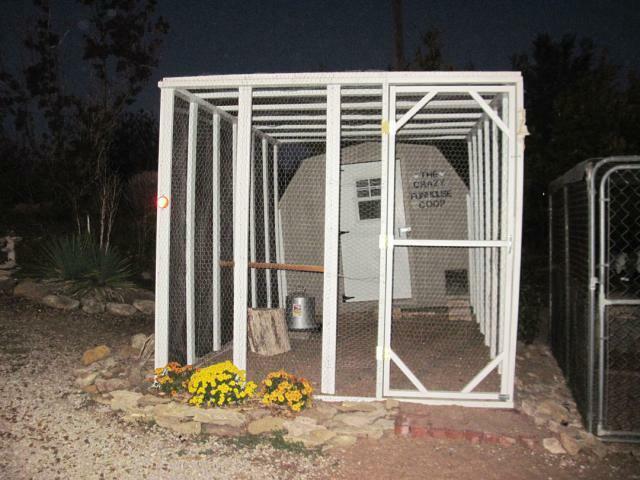 But finally as of October 3, 2011 my coop is finally almost done so that I can take some photos & show it off. Since our property is in the Flint Hills in Kansas we don't really have any level areas here. Our house is built into a hill with the back lower part being underground. 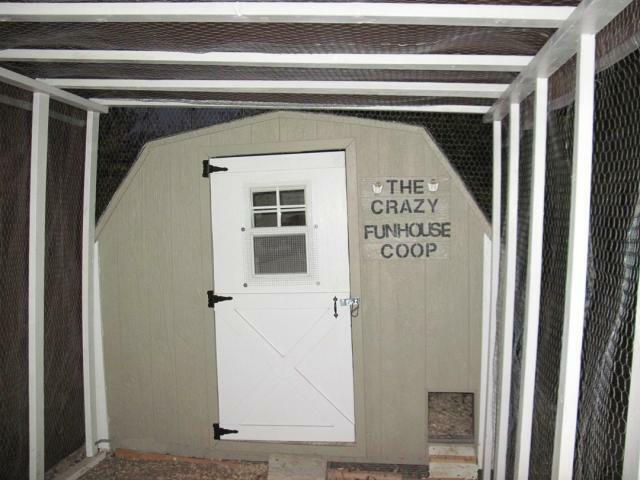 So this being the case, we had to level the shed, making it look off-kilter & when you look through the run to the shed it makes you a little dizzy, thus the name of our coop is The Crazy Funhouse Coop. This is our coop from the outside. Inside view before I put the nestboxes back in after painting. The nestboxes with fake eggs & my Rhode Island Red rooster Big Red & Barred Rock hen Roseanne checking them out. 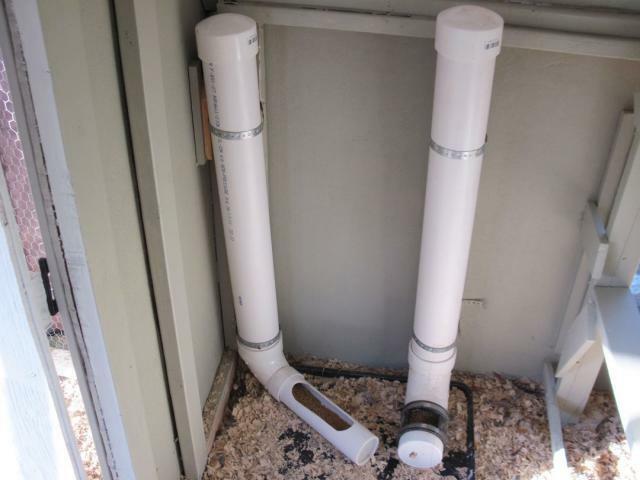 The PVC feeders I made, I'm rather proud of them! The run, you can see what I mean about it looking off-kilter, but it's level inside. 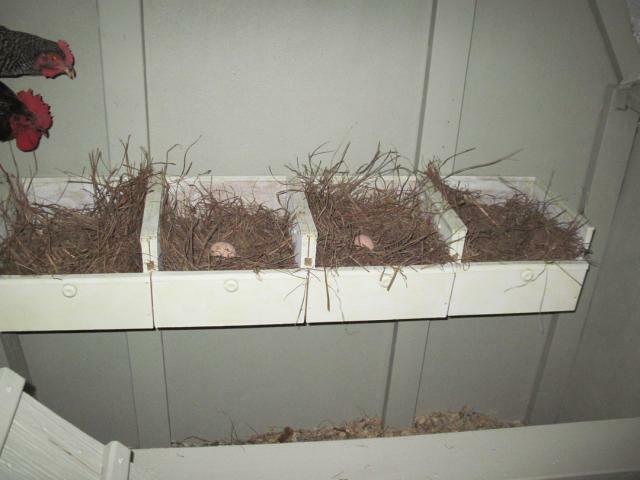 As of October 3, 2011 none of my hens has layed yet, hopefully (fingers crossed) soon? I have 2 Red Stars, 2 Barred Rocks, 2 Easter Eggers, 2 Partridge Rocks, & 1 Rhode Island Red Rooster in the oldest group. Then I have 2 Black Australorps, 1 Golden Laced Wyandotte, 1 Easter Egger rooster, & 1 Partridge Rock rooster that have been in the brooder & these are 10 weeks old. Now that all the painting is done I plan to build a little pen in the coop so the two groups can get to know each other this week. The young ones are outgrowing their brooder & would dearly love to get out of there. Rudy my little Partridge Rock roo loves to jump up on the screen whenever I open the top to feed them. I also plan to get more chickens later this month. I will be getting 2 Black Copper Maran hens & a rooster, 2 Ameraucana hens & a rooster, & 2 Lakenvelder hens. I plan to raise some BC Marans & Ameraucanas next year, so I will have to build another coop & runs for them for breeding. I'm excited to get the new chickens & it will be interesting to see how it all works out. This will be my first winter with chickens for many years, so we'll see how that goes too. An update: Today, Oct. 5, 2011 we got our first egg! I'm not sure which hen laid it, but I think it was one of the Barred Rocks. 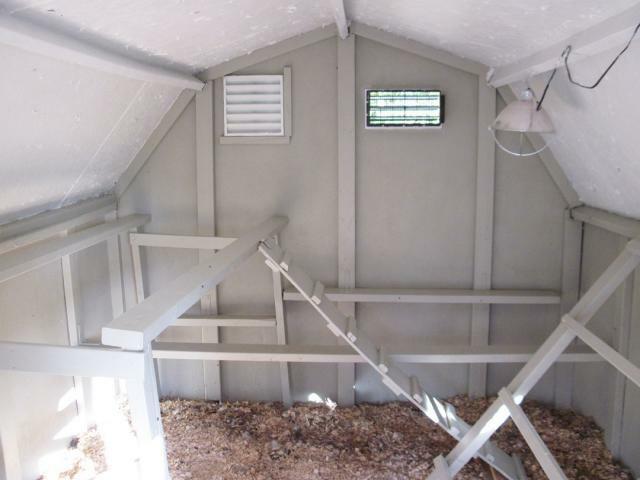 Also, I did get the pen built inside the coop & moved the young chicks in there yesterday. They love it in there! So far nobody really is paying a whole lot of attention to them, I guess that's good. Well it was the Barred Rock hen I call Roseann that is laying. The others should be laying soon. As of Dec. 11, 2011 we have 5 hens laying on a regular basis including Audrey, my EE hen who lays a pretty blue-green egg. There are a couple of hens joining in laying very small pullet eggs in the last few days, but I don't know which ones. We have added two Great Pyrenees puppies as of Nov. 26, 2011 as LGDs to protect my chickens, Lily & Jasmine. I will ad pics of them when I can.